Even though it's expensive and highly sought after, it's really not all that scarce and difficult to find in high grade. Chamberlain's legacy as the most dominant player of all time is the key value driver more than anything. A unique thing about his rookie card is that it coincided with his greatest season during which he averaged 50.4 points and 25 rebounds per game. That same season is when he set the single season scoring record with an unbelievable 100 points in one game. Team info across the top with a red background. Name and position in the middle. And then a black and white image of a young Chamberlain in roughly the lower 60% of the card. It's a straightforward design but the three sections give it a distinct look compared to most other cards in the hobby. Centering is probably the toughest challenge for collectors. Print defects are also a concern but not as much so as the centering issues. General wear and chipping are also common. The back of the card speaks to his dominance on the court. The funny part about it is that the scoring numbers he accumulated that Fleer mentions would be shattered during the 1961-1962 season. You think 38.3 points per game is a big deal? How about 50.4 point per game the next season. The use of another one of his great nicknames "The Big Dipper" also pops up in the discussion. The back is packed with a ton of information, more than you'll usually find on any given sports card. A simple blue stripe flanks the right side of the card with his number 8 encircled near the top. It's the key card to the entire 1961 Fleer basketball card set and the standout of a group of other well-known rookies such as Oscar Robertson, Jerry West, and Elgin Baylor among others. 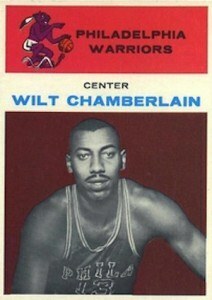 The first thing most collectors ask is: how much is a Wilt Chamberlain rookie card worth? It's not too difficult to find a Chamberlain rookie card in high grade. In a PSA 8 holder you can expect to pay around $7,000 or higher. PSA 9 graded copies will run you in the tens of thousands of dollars. And if you're able to snag a PSA 10 copy, then it's anyone's guess how much those will go for these days. How do buyers and sellers determine the value of a Wilt Chamberlain rookie card? Condition. Is it centered? Does it have sharp corners? Are the edges free of wear and chipping? Is the surface clear of any print defects and other eye sores? Is it professionally graded? While some collectors view grading negatively, it cannot be argued that graded cards are worth more than raw cards. Many will debate whether he was the greatest to ever play the game. Michael Jordan and Kareem Abdul-Jabbar are likely 1 and 2 on most lists but "The Stilt" is up there. What's not debatable was how dominant he was. That dominance makes him one of the most collectable players in the hobby. He led the league in scoring a ridiculous seven seasons in a row. And you already know about his 100 point game and single season average of 50.4 points per game records. During his 14 seasons as a pro he would also lead the league in rebounding 11 times. He'd finish as the NBA's all-time leading rebounder with 23,924. He once even grabbed 55 rebounds in one game! Yes, that is also a record. He was NBA Rookie of the Year (1959-1960), a four-time MVP, thirteen-time All-star and two-time champion. His dominance over the course of his career is the stuff of legend and not likely to be repeated anytime soon. At any given moment he could singlehandedly take over the game. Elected to the NBA Hall of Fame in 1979 Chamberlain was a hardwood legend and for that reason he remains one of the most highly collected basketball players in the hobby today. That's what makes Wilt Chamberlain basketball cards so collectible.